1) The Antimicrobial Testing Gap - Application of Ink Jet Printing, Digital Dispensing Technology. We call the time between when empiric antimicrobial therapy (Rx) is begun, and antimicrobial susceptibility (AST) results are available the "antimicrobial testing gap." Typically this gap may be 2-3 days depending on the time necessary to culture the organisms. Antimicrobial susceptibility results are not practically available until the day after bacterial colonies are isolated. With the dramatic emergence of antimicrobial resistance, especially among Gram-negative pathogens, sometimes we perform antimicrobial susceptibility testing (AST) on bacterial isolates, and find that the organisms are resistant to all antimicrobials tested or practically resistant to all antimicrobials if the patient is allergic to or cannot tolerate antibiotics that remain active. We then need to test agents that are more rarely used, for example, colistin, considered one of the agents of last resort for treatment of carbapenem-resistant Enterobacteriaceae. Unfortunately, colistin and a number of other agents that may be useful for treatment of multidrug-resistant infections cannot be tested in hospital-based clinical microbiology laboratories. Therefore, isolates must be sent to a reference laboratory where a reference method called broth microdilution or agar dilution testing is performed. 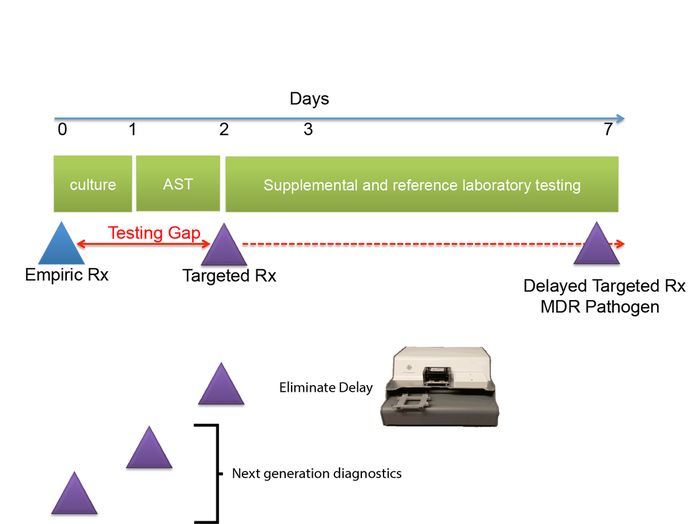 This process delays the availability of AST results for several additional days -- time that patients with multidrug-resistant infections can ill afford. One of the central goals of the Kirby laboratory is to address and shorten the antimicrobial testing gap through use of novel technologies. We recently described and validated use of digital dispensing technology, specifically employing a modified inkjet printer, the HP D300, to enable laboratories to perform broth dilution testing of any antimicrobial at will in 384-well microplate miniaturized format. Importantly, we found that this method was just as accurate and more precise than the gold standard reference method. Importantly, the technology will enable laboratories to facilely perform reference broth microdilution testing in house and therefore avoid the need and long delay associated with reference laboratory testing for drugs such as colistin. A manuscript describing some of our studies with digital dispensing technology was published in the Journal of Clinical Microbiology and further discussed in a press release. Potential applications of digital dispensing technology for addressing several issues in antimicrobial susceptibility testing are discussed in our editorial titled "How inkjet printing technology can defeat multidrug-resistant pathogens" published in Future Microbiology. We further used inkjet technology to enable facile performance of synergy testing. The idea behind synergy is that two drugs working together can be more effective than the sum of their individual contributions. Although the minimal inhibitory concentration (see below) of each drug tested individually may be quite high and indicate antimicrobial resistance, sometimes two antimicrobials can act cooperatively driving the MIC for each drug when used together into the susceptible range. Thea Brennan-Krohn from the laboratory recently described synergy testing against a large number of carbapenem-resistant Enterobacteriaceae (CRE). Alarmingly, there are often no therapeutic options left for these multidrug-resistant pathogens. Importantly, we found that for about 90% of CRE there was at least one clinically relevant synergistic combination. However, effective synergistic combinations varied from strain to strain, providing rationale for prospective synergy testing to identify active combinations. Notably, the traditional method for synergy testing requires an inordinate amount of time and labor to perform (45 minutes to set up one combination alone). The inkjet printing synergy method as described in our recent publications in the Journal of Antimicrobial Chemotherapy and follow up manuscript exploring synergy against both Gram-negative and Gram-positive antibiotics with colistin in Antimicrobial Agents and Chemotherapy requires only seconds to set up. This technique for the first time provides a practical solution for high throughput prospective or retrospective examination of synergy for a large number of pathogens and antibiotic combinations. We developed a superfast technology for determining susceptibility of pathogens to antimicrobials in hours rather than after a traditional 16-20 hour incubation period, essentially reducing the antimicrobial testing gap by an entire day. MAST combines inkjet printing of antimicrobials and bacteria, advanced microscopy, and machine learning, specifically convolutional neural networks, to determine MIC values within two hours. Importantly, MAST uses off-the-shelf supplies and is highly accurate. The MAST concept was select as a 2017 SLAS (Society of Laboratory Automation and Screening) Innovation Finalist and chosen for a competitive Harvard Catalyst Advanced Imaging and Nanotechnology Pilot Award. A description of initial development of the Microscopy-based Antimicrobial Susceptibility Testing platform was recently accepted for publication in SLAS Technology. In collaboration with Tania Konry and Elizabeth Hirsch of Northeastern University, we seek to develop microfluidic, lab-on-a-chip platforms to identify pathogens and determine their susceptibility to antimicrobials directly from patient specimens in under three hours. The platform is called ScanDrop. The sticky issue is that minimal bactericidal activity (MBC) testing is so cumbersome to perform that no one ever does it; and because of this difficulty, the clinical correlation data for MBC values is also not reliably available. Traditionally, MBC testing is done through serial dilution, plating, and colony forming unit determination for every growth well where growth of organisms is inhibited. The antimicrobial concentration where growth is inhibited by 99.9% is considered the MBC. The MBC procedure is a LOT of work to do even for a single bug-drug combination, let alone testing against the panel of drugs that we want to examine for each clinical isolate. To address the MBC information gap, we have developed novel technology to rapidly determine both the MIC and MBC, a technology that in principle could be adopted facilely in a clinical microbiology laboratory setting and thereby rapidly provide important data for our clinicians. We are currently exploring the potential of this technology to identify tolerance, especially in multidrug-resistant pathogens, to identify optimal regimens that may remain available. The "inoculum effect" is the general observation that the minimal inhibitor concentration (in other words level of resistance) of an organism to an antibiotic increases when a higher density of organisms is tested. This effect is especially prominent for beta-lactam antiibiotics. It is of potential clinical concern in patients during infections where organism burden is high. Some types of infections with high organism burden include abscesses and intra-abdominal infections. Recently, we investigated whether subtle differences in inoculum within the range allowed by current standards can effect the susceptibility testing results that clinical laboratories obtain and provide to clinicians. Our findings for organisms with certain types of multidrug-resistance and antibiotics like carbapenems and 4th generation cephalosporins used to treat such multidrug-resistant organisms indicate that these small allowable differences in inoculum could change the MIC determinations markedly. MICs differences of up to 8-fold were observed when comparing the lowest to high boundaries of the recommended, allowable inoculum range. These MIC differences were large enough to affect whether pathogens were designated susceptible or resistant to the antibiotics tested. These results have profound implications for testing of carbapenemase and extended-spectrum beta-lactamase producing organisms. Currently guidelines suggest calling these organisms susceptible or resistant solely based upon their MIC. Our data suggest that use of a very accurate inoculum is a prerequisite for obtaining accurate and reproducible MIC results for these types of pathogens. Interestingly, the new drug combination, ceftazidime/avicbactam did not appear to demonstrate a significant inoculum effect. Our findings were recently published in the American Society of Microbiology journal, Antimicrobial Agents and Chemotherapy. We have close ties to the BIDMC Clinical Microbiology Laboratory which Dr. Kirby also directs. We constantly seek new ways to apply basic and translation observations to improvement of clinical diagnostics. Projects may also be performed by Clinical Microbiology Fellows or Residents, who spend periods of time in the research laboratory.